On March 4, Lily attended the 2019 Into Film Awards in London. High quality pictures from the event have been added the gallery. Lily graces the cover of Madame Figaro China for this month issue and the photoshoot looks amazing! We’ve updated the gallery with a few high quality outtakes, enjoy! HARPER’S BAZAAR UK – Sparkling with lights that twinkle from its mirrored walls and bounce off its polished marble floors, Claridge’s is always a magical place for a wintry rendezvous. And this grey, chilly lunchtime, the establishment has truly outdone itself; for there, tête-à-tête in a cosy corner of the restaurant, sit Lily James and Matt Smith, better known as Cinderella and Doctor Who, in close confabulation. No wonder the small children sitting at the next-door table have swivelled round on their seats to gaze in unabashed wonder. And who could blame them? James is enchanting, adorable, a star who appeals across the genders and generations. 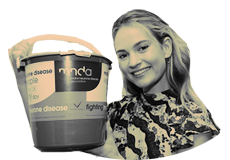 From her breakthrough role as Lady Rose in Downton Abbey, to Disney’s new Cinderella, followed by the beguiling Natasha Rostova in War & Peace, and then, last year, stepping into Meryl Streep’s dancing shoes for the Mamma Mia! sequel, she has embodied a series of delightfully giddy heroines. More surprisingly, her innate sunny likeability has cast the same glow over other, less immediately appealing roles, including a diner waitress in the action film Baby Driver and Churchill’s conscientious secretary in Darkest Hour. Her relationship of four years’ standing with the equally beloved Matt Smith seems to be just another chapter in a fairy-tale career. 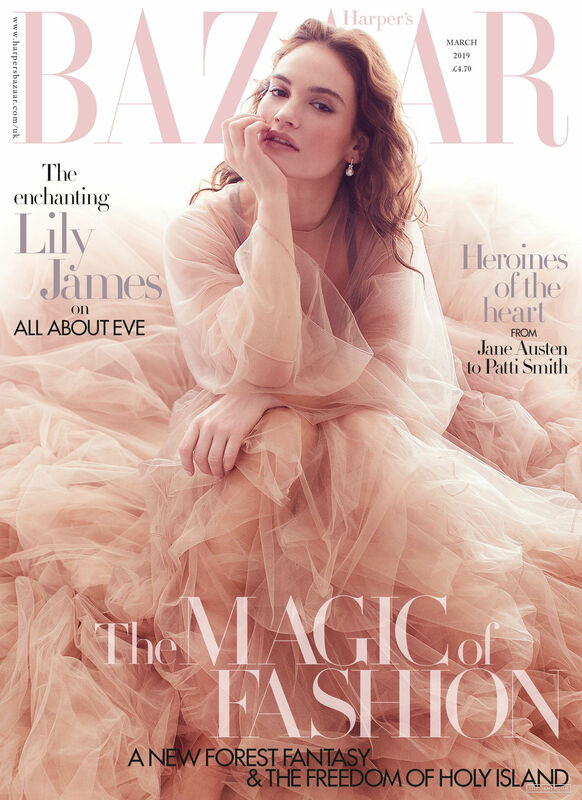 ‘I think charm is the most important ingredient in a human being… That is what Lily James has,’ Downton Abbey’s creator Julian Fellowes once told Bazaar. I’m actively seeking characters from now on that are different, who don’t rely on charm or the qualities that I think I’ve explored quite a lot.’ Perhaps it’s not such a surprise (though it is a great shame) that she won’t be reprising her part as Lady Rose in the eagerly anticipated Downton Abbey film. ‘My character is in New York, and they couldn’t bring everyone back,’ she says diplomatically. 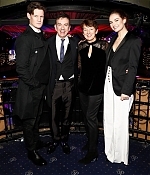 Back on Monday night (November 26) Lily attended ‘Putting On The Blitz Kids: The National Youth Theatre Annual Gala’ at Cafe de Paris in London, together with Matt Smith. For the event Lily was wearing a black silk-blend shawl lapel blazer by Burberry and white women’s button flared trousers by A.L.C (thanks to Dress Like Lily James for the infos!). Back on Saturday night (November 24) Lily, together with her Mamma Mia! 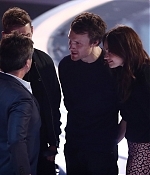 Here We Go Again co-stars Jeremy Irvine and Hugh Skinner, were among the audience of the X-Factor ABBA Special episode. Photos from the episode have now been added to the gallery, enjoy! VARIETY – Lily James and Armie Hammer are set to star in Netflix and Working Title’s “Rebecca,” directed by Ben Wheatley. Jane Goldman is writing the screenplay, adapted from Daphne du Maurier’s classic Gothic novel of the same name. The story follows a newly married young woman who, upon arriving at her husband’s imposing family estate on a bleak English coast, finds herself battling the shadow of his deceased first wife, the mysterious Rebecca, whose legacy continues to haunt the house. Working Title’s Eric Fellner and Tim Bevan will produce along with Nira Park. The film is expected to go into production in the spring. James is represented by UTA and Tavistock Wood Management. Hammer is repped by WME and Sloane, Offer, Weber & Dern. 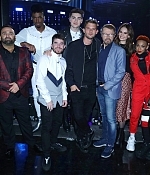 Wheatley and Goldman are repped by WME and Independent Talent Group. Wheatley is also repped by Bloom Hergott.